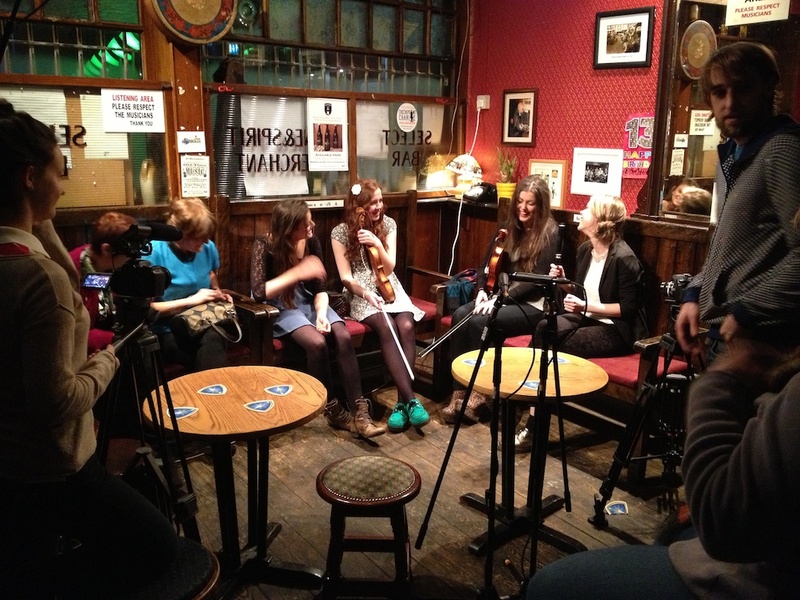 Charlottesville’s Kevin Donleavy has an Irish music program on air tomorrow. I hope you’ll tune in via internet! He explains how, below. I always enjoy hearing Mick O’Grady play at the Cobblestone pub, and he’ll be featured in the program. Photo of Stefan Paz Berrios and Mick O’Grady, downloaded from Danny Diamond’s Flickr site. To listen on your internet radio, select WTJU in Virginia, USA, or pick up the “Tune In Radio” app for your iPhone or other mobile device and easily dial up the station. On your computer, go to http://wtju.net. Next, select Listen Live on the right side bar. Then, choose between Ogg and MP3. This week’s musical material includes singers Andy Irvine, Paddy Reilly, Tim Browne, Muireann Nic Amhlaoibh (Maryann McCauley), and Christy Moore. 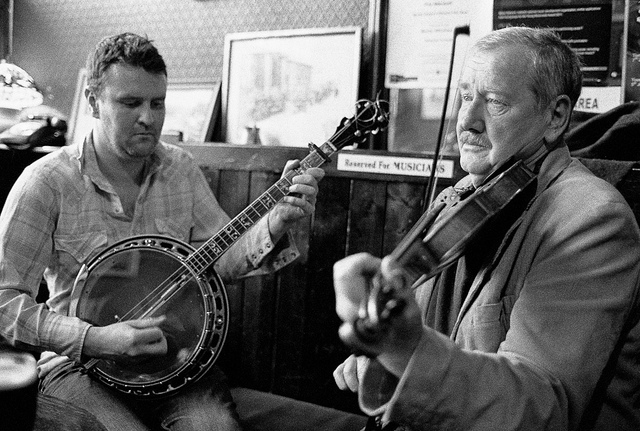 There will be tunes from banjo expert Kieran Hanrahan and fine box-player Danny O’Mahony. 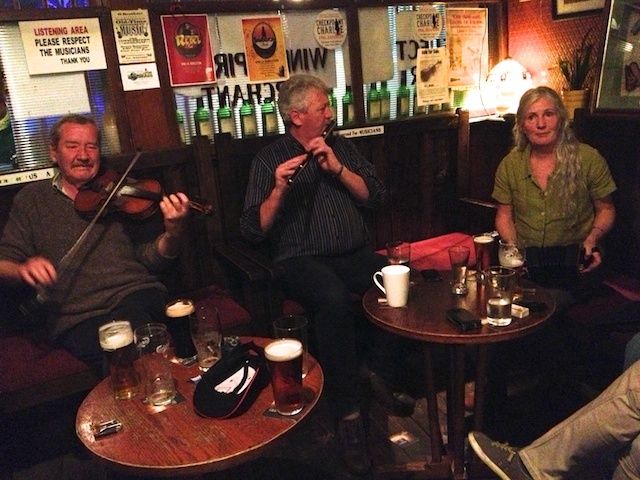 The fiddlers this week are Mick O’Grady and Washington/Baltimore’s own Jesse Smith. And if you like the sounds of uilleann pipes and fiddle, you’ll enjoy tunes from Mick O’Brien and Caoimhin O Raghallaigh. There will also be some chat about such Irish organizations as Comhaltas, Clann Mhor, and BRIMS (the Blue Ridge Irish Music School). Hope that you can have a listen on Saturday …. I forgot to mention to you that the Horseshoe is quite famous as a venue for trad musicianers over the past 5 or 6 decades. Lynch can tell you all about why. It hinges on magnificent fiddler-and-concertina-player John Kelly who ran the shop for aeons. He’s gone, RIP, but his fiddling sons James (lives in Florida now) and John (still lives in Ireland) carry on that family musical tradition. Ah, John Kelly the elder — he attracted the likes of Seamus Ennis and John Egan and loads and tons of musicianers to that wee shop. Why don’t ya ask Lynch about the pub at the corner where John and others held forth of an evening ? or the pub called the Meeting Place (also fairly nearby). Oh, I also nearly disremembered the following — that Mike Heivly has sent some of his work to the Embassy of Ireland, and will probably have a one-man show sometime in the next few months. Stay tuned! The Embassy is in DC, on prestigious Mass Ave (ie, Massachusetts Avenue). A small edifice, but it’s (I’m guessing) early 19th c., sorta French looking with Baroque elements. Neat building. Today, I needed to purchase a new external hard drive so I could download photos for you. On the way to the computer store, I ran into Brendan Lynch. He ran the musical performances I attended at the Arlington Hotel with Esther, Kitty Lee and Patty. He also owns The Horse Shoe, located where Capel runs into Bolton Street. Brendan had the door to his shop open and the sounds of an Irish banjo filled the air. I stepped into the tiny space, introduced myself, and learned a bit about Brendan’s past and present work. Turns out Brendan is an artist, photographer, musician, performer, music teacher, instrument trader, city planner, conservation expert, and business owner… a Renaissance man in my book. As he’s also a history buff, I told him about Fergus Whelan’s book, the planners I’d come across when visiting the former parliament building, and the tour I took recently with DIT’s Gavin Buggy. …who also plays weekends at the Arlington Hotel’s traditional music and dance show. Brendon is an artist, musician, and city planner specializing in conservation (though there’s no funded work in that vein for him to do today). hosted by DIT’s Gavin Buggy. …and showed us what the district around Dublin City Council looked like in medieval times. 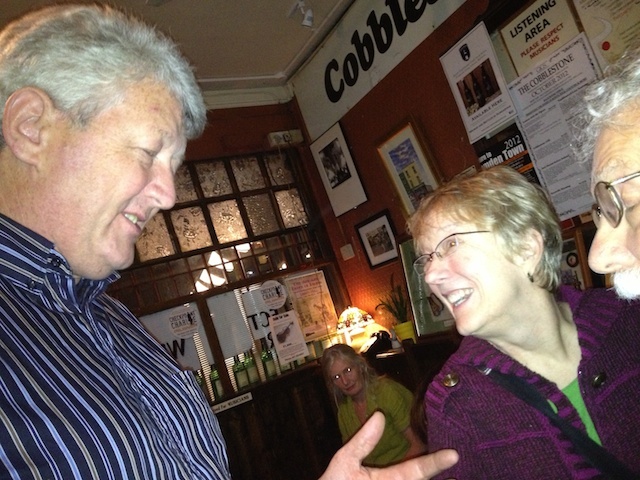 Mom with her cousin, Tom Mulligan (left) and Tim Bigelow (right) meeting at the Cobblestone Pub. What a great send off! Mom and her friends left for the airport at five o’clock this morning, so last night we decided to meet after my yoga class at the Cobblestone Pub. 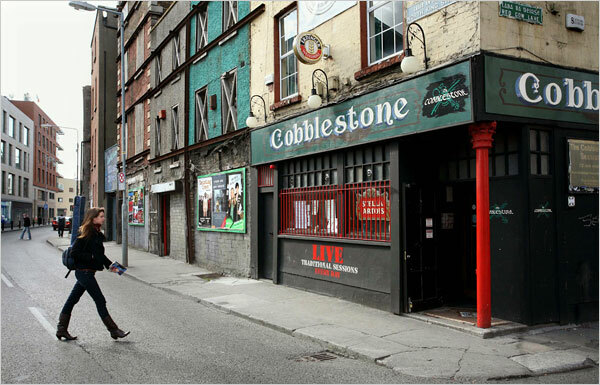 You may recall from an earlier blog that the Cobblestone is considered the best place in Dublin to hear traditional Irish music. We went there with Fulbright Amanda and her husband Jonathan, so they’d have a chance to play their instruments for an audience in Dublin. A girl from last night’s yoga class said it would definitely not be a problem for me to go to the Pub in my exercise clothes. So I headed straight there–yoga mat and all. When I arrived, Mom immediately introduced me to Tom Mulligan–a cousin of ours from Ballybunion in County Kerry–who she’d just met. 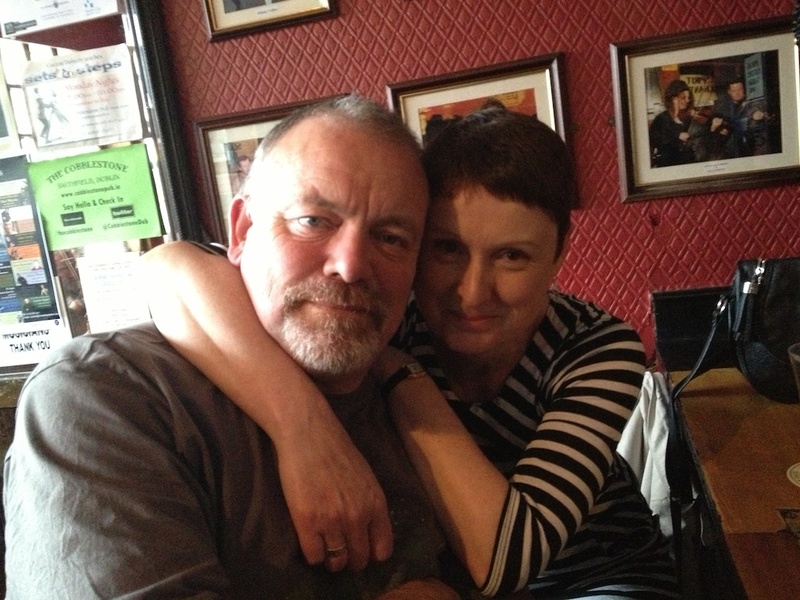 He had inquired about her visit Ireland and she said she’d been to County Kerry visiting Eilish and Con O’Hanlon. Picture of the Cobblestone from the New York Times. Loe and behold, Elish is Tom’s cousin. I think he said his mom is the sister of my mom’s grandmother, but I haven’t been able to reconcile that math yet! He seems so young. Tom is in the middle… doesn’t he look like Bill Clinton!? Tom returned to playing, but when the musicians’ area started to get crowded, Tom packed up his flute and climbed behind the bar. Tom’s son, Tomás, is working on a degree in Irish politics and history at University College Dublin (UCD). His dad completed a similar degree there 2006-2010… the same years I was in school at William and Mary. Tom had gone back to be a good example to his kids. It seems to have paid off! Tomás wouldn’t even take money for my drinks last night. And, Tom gave Mom a copy of his CD to take home. Ain’t it grand to have a family! You may also recall that it was my 2003 visit to the UCD campus that left me determined to become a Fulbright myself. And thanks to my mom’s positive example, I set to work on a PhD three years later. That helped it all come together. So, all in all, it’s wonderful to find a place where everybody knows my name, and they seem so glad I came! 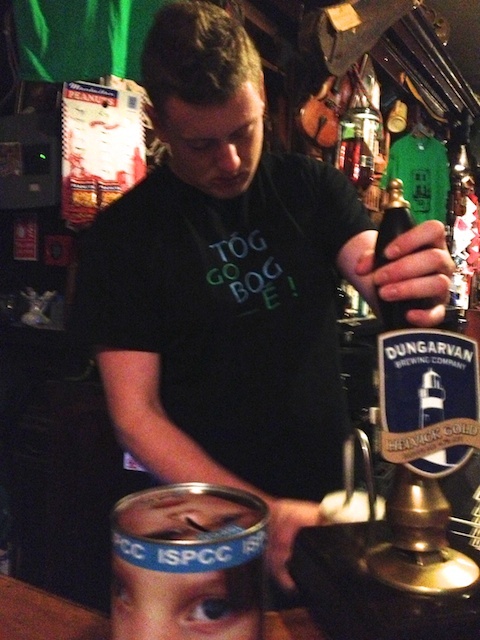 Who have thought I’d find my home in a pub? 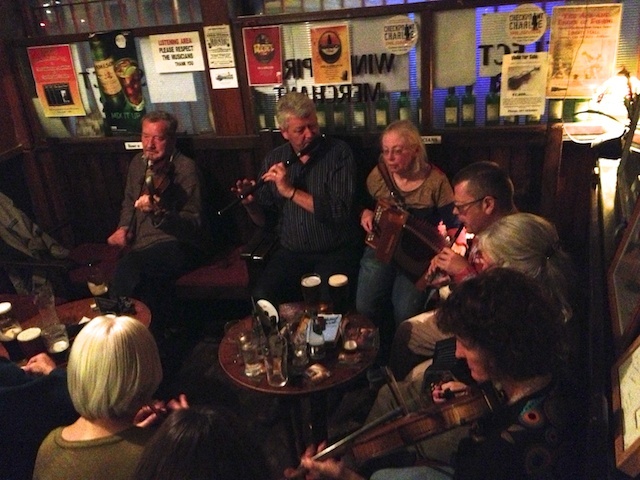 Tom’s brother Neily is one of the world’s premier uilleann (elbow) pipers. I think he’ll be playing Thursday, October 25. See you there? For more information, you can like the Cobblestone on Facebook. By the time I left last night, there’s been more than 14 different musicians chiming in. I can’t wait to return!